Matador has emerged as a clear market leader in packable travel gear. Since launching with its original Pocket Blanket back in 2014, Matador has since expanded to offer full lines of high quality, lightweight backpacks and travel accessories. Earlier this year, Matador introduced the FlatPak, which included a soap bar case and toiletry bottles. More recently, in November Matador introduced the Advanced Series, with updates to existing products and new releases. Matador’s FreeFly16 on display at Outdoor Retailer Winter Market. 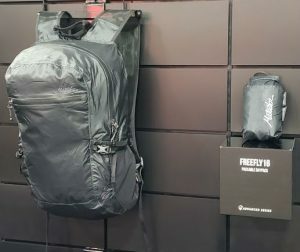 FreeFly16: Measuring just 4.8-ounces, the new FreeFly backpack features CORDURA fabric, sealing zippers and sealed seems. It’s weatherproof, has deep side pockets, compression straps, breathable shoulder straps and tether points. The FreeFly is the lightest and most compact backpack from Matador. 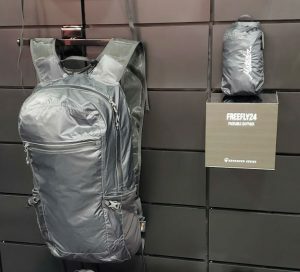 Freerain24 2.0: An update to the Freerain24, the Freerain24 2.0 also contains CORDURA fabric, and has sealed seams, a rolltop main compartment and sealing zippers. Measuring just 6.6-ounces, this pack can hold 24 liters and features compression straps, an adjustable sternum strap and tether points. It also has breathable, and weight-distributing shoulder straps. Transit30 2.0: An update to the Transit30 duffle, the Transit 2.0 measures just 5-ounces and can hold up to 30 liters and 30 pounds of gear. It features sealing zippers, tether points, an added external pocket, and snap-together handles. 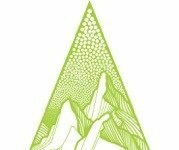 We had the chance to catch up with Matador founder Chris Clearman at last week’s Outdoor Retailer Winter Market in Denver. Matador’s Freerain24 2.0 on display at Outdoor Retailer Winter Market. As Clearwater explained, customers will find the Advanced Series to be much easier to travel with. The FreeFly16 (MSRP: $54.99), Freerain24 2.0 (MSRP: $64.99) and the Transit30 2.0 (MSRP: $49.99) are available now at select retailers and online.